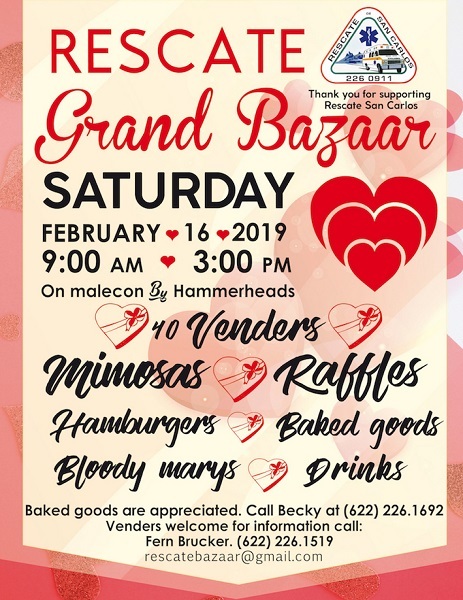 The annual Rescate Grand Bazaar will be held on Saturday, February 16, 2019, from 9:00am to 3:00pm on the malecon by HammerHead’s Restaurant. It will feature 40 vendors selling good such as beautiful jewelry and local crafts. You can also buy delicious baked goods, hamburgers, bloody Mary’s and drinks. Come enjoy a stroll, browse the Market Place, and have a bite to eat and a drink. All proceeds benefit Rescate Emergency Medical Services. Spaces are still available for rent for you to showcase and sell your wares. 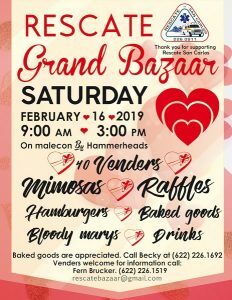 Please contact Fern at 622-226-1519 or rescatebazaar@gmail.com. For donating baked goods, call Becky 226-1692. Is it time to Renew (or begin) your Rescate Membership? You can do so at the Rescate Grand Bazaar.